Cramps will always come and go in different parts of the body, but for those who experience foot and leg cramps regularly, the pain causes a lot of discomfort that is hard to ignore. Sometimes, people get foot cramps so badly that they have to go and see a brampton chiropodist for care. For most people, the immediate reaction to a foot cramp is massage; this is smart. You should apply pressure using your fingers to the area of the foot that is cramping and press firmly on the spots where you feel the pain. A hard or soft touch can be appropriate depending on which one works best for you in reducing the pain. Massage reduces muscle tension and also helps blood flow to the affected muscle. A stretching exercise helps a lot when a foot cramp strikes out of the blue. The stretching exercise involves extending your leg in front of you in either a sitting or standing position, or you can point your toes to the sky and stretch. Stretching increases blood flow to the affected area to ease the cramp. It is recommended that you remain in a stretching position until the cramp goes away. This can also be used as a preventive measure by stretching before going to sleep. Rubbing ice or a heating pad on the affected cramp eases inflammation to relax the muscle cramp. When using a heating pad, make sure the temperatures are comfortable so that you don’t burn yourself. In most instances, cold or hot compresses will make the pain disappear in just a few minutes, although it is better you leave it there for about ten minutes to make sure that the pain goes away completely. Vinegar contains acetic acid, which helps the body make acetylcholine, a neurotransmitter which improves our muscle functionality. Therefore, the more acetylcholine in your body, the better your muscle function. Drinking pickle juice or drinking apple cider vinegar dissolved in honey or eating any type of mustard will provide fast relief from cramps. This is why most athletes are seen with mustard packets which help them every time cramps strike. As previously mentioned, dehydration is one of the causes of foot and leg cramps and increasing your fluid intake is a great remedy. There are several conditions that lead to dehydration, such as, kidney failure, diarrhea and electrolyte imbalances which all increase the risk of cramps. Similarly, excessive sweating during exercise or when sick leads to excess fluid loss. Drinking a lot of water reduces muscle spasms which are caused by loss of salt, calcium, magnesium and potassium. At times, these foot and leg cramps are caused by a deficiency of certain vitamins and or minerals that are essential in the body. 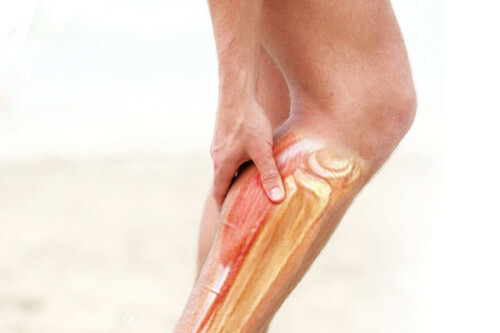 Calcium and magnesium supplements can help get rid of muscle cramps fast. Other muscle relaxants as well as Vitamin E supplements are recommended by doctors for those suffering from regular muscle cramps. However, before taking any supplements, you must first consult with your doctor so that you don’t take anything that has side effects. The pregnancy related cramps can be resolved by wearing supportive stockings, applying heat and elevating your legs. Pressure on the nerves and blood vessels, weight gain and changes in blood flow are some of the causes of leg cramps during pregnancy. Still on the dressing code, as a preventive measure, always ensure that you put on the appropriate footwear when going about your daily activities or when exercising to ensure that you move freely without straining your muscles. Wearing a toe stretcher not only eases the pain of a foot cramp, but it also reduces its frequency if you wear it for at least an hour a day. Toe stretchers improve bone alignment and they also stretch muscle ligament to reduce muscle tension around the toes. Stress and anxiety are also known to cause your feet and legs to cramp in some cases. Chamomile tea helps to relax the body and taking a cup of this tea when you experience foot cramp can help ease the pain. Of course, this will be after exercising your foot to ease the cramp and the tea just helps you to calm down and relax your muscles. You can also visit a health-food store and get cramp bark tea, which contains valerianic acid, that is well known to relieve cramps in any part of the body. Strengthening the foot muscle helps reduce leg pain and it also reduces the occurrence of foot cramps. Try out exercises that train your toes as well as calf workouts which will ease the cramps and keep them away for the night. If you exercise appropriately and regularly, you will gradually improve the strength of your feet and muscle cramps will not bother you. Leg cramps don’t occur only due to presence of weak muscles, but they are also as a result of unhealthy lifestyles and behavior. Adhering to a healthy, balanced diet improves the strength and flexibility of the muscles. This should be coupled with regular exercises, which build muscle strength and prevent the occurrence of cramps. Since most people experience leg cramps at night, adopting an appropriate sleeping position also helps reduce incidences of cramps. The worst thing about foot cramps is that, one minute you are okay and the next minute you are in so much pain that you don’t know what to do to ease the pain. As you try and adopt a healthy lifestyle, the above remedies always provide you with fast, easy and effective solutions every time you want to get rid of foot and leg cramps.